So you really want to grow your relationship with God, but every time you start reading your Bible or praying, a million things compete for your attention. I get it! You feel like you can’t control the interruptions, but what can you do to alleviate the issue? Today I wanted to provide 6 ways to limit quiet time distractions. These ideas are designed to get ahead of the problems. You can limit the issues that vie for your focused time with God! We all live in different situations and seasons of life. However, my hope is that you will find at least one of these ideas to be truly helpful, right where you are. 1. Find your best uninterrupted time of day. I love spending time with God in the mornings; but as I’ve passed through different parenting seasons with all the stages and ages, I know that mornings don’t work the best for everyone. Maybe your commute to work is the best time for you to spend reading. Maybe it’s while you’re on the bus or carpooling. Perhaps your best time is during your work lunch hour or the last half hour before bed. The key word in this point is “uninterrupted.” If you choose the time of day when you naturally have the least interruptions, then this will help limit quiet time distractions. 2. Use the same designated place each day. Having a set place for your quiet time with God each day provides a unique self-accountability. You see the chair and know what time it is. You form the habit and it makes it hard to miss. Using this designated place each day also helps in regards to the next tip to limit your quiet time distractions. 3. Notify your household members of your designated time to spend with God. “Hey,Honey, I just wanted to let you know that I want to be faithful to spend time with God each day and I’m thinking that 6:30 am would work well for me. What do you think?” This could be the opening of a family conversation. If your spouse, children, or roommates know the time you’ve set aside, then I feel certain they will want to respect that time. and not interrupt during your special time with God. Maybe you already assume they know this because you have tried to have your quiet time with God around the same time each day for awhile. Could I encourage you to have a conversation about it? This will help everyone in the household know how important having quiet time with God is to you. Also, especially if you have younger children, having a visual signal to serve as a reminder of your time can be an additional help. Years ago, I created a door hanger to use for this very purpose. 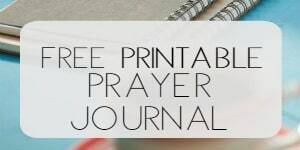 If you have your quiet time in the master closet, bathroom, bedroom, or whatever room, use this “prayer in progress” door hanger. It can be a simple tool to help everyone be respectful and not interrupt your time with God. If you don’t have a door, set up some other visual signal for your family members to remember what time it is. 4. Write a focus list (brain dump) ahead of time. If my brain is spinning with all I have to do for the day, then getting thoughts down on paper and out of my head has always been helpful to me before I spend quiet time with God. I have learned how to process to-do’s and projects to keep my head from working so hard. But again, there are various seasons in life that can cause thoughts to churn more often than others. If my thoughts are the very things causing me to lose focus during my quiet time with God, then I want to get them down on paper. After writing them down, I like to pray over the list and ask the Lord to help me not to think about those things any more while I try to read my Bible and pray for others. 5. Leave your phone in another room or turn off notifications. I love technology, but phones can be such an unnecessary interruption. If you have difficulty with shutting out your phone, then leave it in another room during your personal time with the Lord. What if you use a Bible app or other devotional/study/journal apps for your quiet time? My advice is to turn off all notifications on your phone while you spend time with the Lord. 6. Set a timer and don’t think about anything else until the timer goes off. Watching the clock due to time constraints can be a distraction during your quiet time with God. If you know that your time with God is limited to 20 minutes, then set a timer to prevent you from continually looking at the clock. There have been occasions in my life when I knew the baby would be waking up at a certain time and this made me feel like I needed to watch the time. I felt like I was hitting the snooze button with God. To keep my mind focused during my quiet time with God, sometimes setting a timer was the key to let everything else go during that focused time. 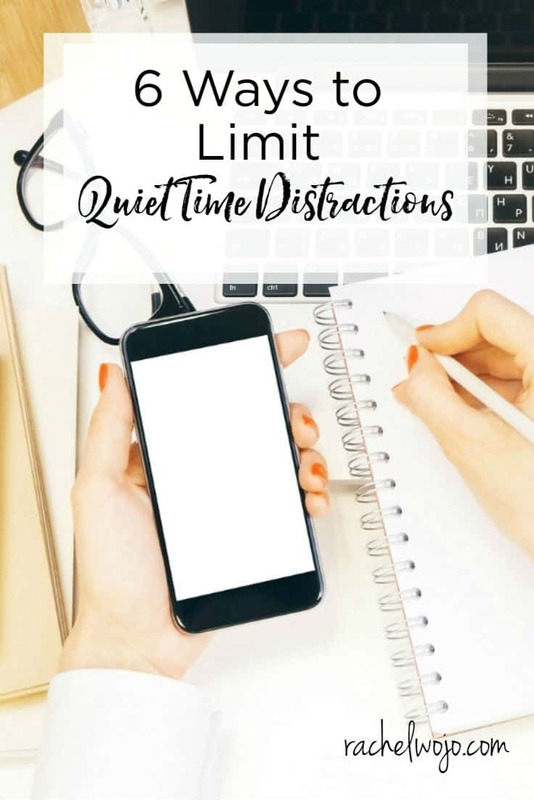 If distractions cause you to miss out or prevent you from being truly focused during time with God, then my prayer is that one of these tips will be the solution to limiting or even eliminating distractions! Which idea is the one you can’t wait to try? I’d love to hear from you in the comments today! Thank you for these encouraging ways to spend time with God. I have been praying that this year, I would be better at spending more time with God. How do you know what to read or what book in the Bible to read? This is my struggle. Thank you for any help you may offer. Great question! You will need to find a Bible reading plan that works for you and yes, that can be a challenge. 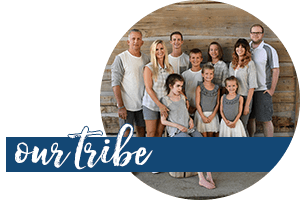 I offer monthly Bible reading challenges so you have a guide to know what to read and so many folks have found these to be the perfect solution to this dilemma. 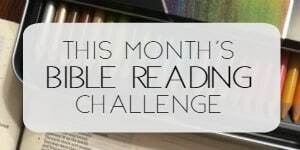 Check out the left sidebar and “monthly Bible reading challenges.” ENJOY! I really like the idea of setting a timer. I am often distracted thinking about what I need to do next, but I think if I had a particular amount of time set aside, I’d be able to focus better. Thanks!